Sussex County native Danny Kass brought national attention to the Skylands Region in the 2002 Winter Olympics when he won a silver medal for snowboarding. For those in the area who knew nothing about the sport, it suddenly became interesting. But the sport has long been available, as Mountain Creek in Vernon is Kass' home mountain. 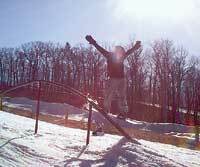 "I think Danny Kass has had an effect on the (popularity) of the sport around here," says Jim Tust, administrative manager of Shawnee Mountain in the Poconos. "All that coverage can excite young people and I think he'll serve as a role model for some of these kids." "I don't know if (Kass) will influence adults too much in terms of trying it, but he will do a lot for kids," adds Jennifer Wetmore, assistant director of Shawnee's Ski and Snowboarding School. "If it does influence adults, it's because it will make them more willing to let their own kids come out and try snowboarding. "My folks weren't enthusiastic at all about letting me get on a snowboard. They thought it was too dangerous, that I was going to get hurt, that all the people who snowboard are strange looking, they're a nuisance and I didn't want to be with them." Indeed, the sport has grown up with skewed perceptions and misconceptions. But the bottom line is that the snowboarding populace is not a motley crew of grungy, tattooed teenagers who love to wreak havoc on unsuspecting skiers. "I don't know if that was ever the case," Wetmore says. "I think the media and marketers picked up on that small segment and kind of exploited it. Kids wanted to snowboard and be part of a rough, tough, bad element. There are people like that on snowboards, but the demographics have changed so much." Case in point is 52-year-old Milford resident Fred Stem, who began riding five years ago. Since then, he has had two knee operations and still continues to snowboard. Stem's two sons, 21-year-old Justin and 18-year-old Greg, have been riding for the past 10 years. Justin, a Delaware Valley Regional High School graduate who now lives in Colorado, is the three-time defending United States Amateur Snowboarding Association (USASA) Triple Combine national champion. "I used to ski while they were snowboarding," Fred Stem says. "If I wanted to hang out with them and do what they were doing, it made sense to change over to snowboarding." There was a time when there was conflict between skiers and boarders. But that seems to be changing dramatically. "It started as a carry-over from skateboarding," Stem says. "As far as style and attitude, they had these crazy maneuvers and antics they were trying to do in the terrain park. But I find it all handled very politely. What appears to be this kind of group of baggy-clothes kids wearing snowboard jackets, who have reputations as bad boys, are really every-day kids that seem to be respectful and polite on the slopes." And while the kids are still out there, snowboarding has blossomed into an all-ages, all-gender activity. Like Stem, many adults have followed their children into the sport and been pleasantly surprised. The website www.sbhistory.de, credits a man named "Jack" Burchett with inventing the first snowboard in 1929, when he cut out a plank of plywood and tried to secure his feet with some clothesline and horse reins. Some 35 years later, various forms of snowboards began to surface, starting with "The Snurfer" - two skis pounded together with a rope going through the front to enable the rider to keep his balance. In 1969, Dimitrije Milovich built a board that combined surfboards and skis. In 1977, Jack Burton, who had entered various Snurfer competitions, saw major potential in snowboarding. He won his first competition by putting a binding on the snowboard, which made a difference in handling the board. Burton introduced the first real ski technology for snowboards in 1980 and is now a leader in the industry, continuing to streamline the product. 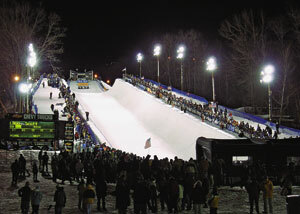 In 1982, the first national snowboard race was held in Woodstock, Vermont. From there the popularity began to grow among youngsters. While many mountains initially resisted the boarders because of the rift between them and skiers, the sport became too popular to ignore. By the 1990's skiers and riders were sharing mountains and soon, terrain parks with quarter pipes and half pipes were opened specifically for snowboarders. The pipes are what you see in the Olympics and X Games, when boarders go up a sloped wall, turn around in midair and come back down. It looks hard and appears to be dangerous, and at that level it might be if you are not prepared. It is also fun and exhilarating. For those who want to try it, there are ample areas in the region besides Shawnee Mountain and Mountain Creek, including Hidden Valley in Vernon, Campgaw Mountain in Mahwah, New York's Hunter Mountain and Ski Windham and the Pocono resorts at Camelback, Jack Frost/Big Boulder and Blue Mountain. The required equipment includes a snowboard and bindings (which are usually attached) and snowboard boots, which are soft sided but fairly stiff in order to support your ankles. Helmets are not required but highly recommended. Beginning riders should rent their equipment when starting out. Once you are certain it will become a fulltime hobby and want to purchase equipment, a quality full package can run from $450 to $500. A word of warning -- do not buy equipment for teens who will outgrow their boots in six months. Wait until the growth spurt stops. According to Wetmore, no one should be intimidated about trying to start snowboarding, no matter what the age. Don't think that knowing how to ski will help; snowboarding is actually easier to learn by going in fresh. "It's no more difficult to learn than skiing," says the 28-year-old Wetmore, who began riding six years ago. "The movements are much different. With the exception of learning to ride the lift, you can throw all you know about skiing out the window when you learn to snowboard. Sometimes it's harder, because people who have skied before are used to doing skiing things and it's hard for them to put those moves aside." Wetmore says the major difference in learning to ski or snowboard is the learning curve. It is more difficult to actually learn how to snowboard, but easier to become proficient at it. In skiing, it is easier to learn, but more difficult to become proficient. She also says there is no difference in the danger level. "The injuries are just different," Wetmore said. "Ski injuries are usually to your thumb and lower body -- knee injuries and things like that. Boarding injuries are upper body -- such as broken wrists, dislocated shoulders. If I had the choice of blowing out my knee or dislocating my shoulder, I'd take the shoulder." While Wetmore feels it is difficult to teach the art of snowboarding without giving a visual demonstration, she did her best to explain the basic nuances of getting started. 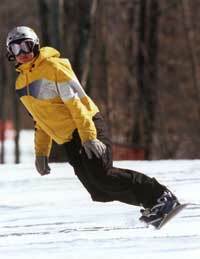 Since a rider has both feet attached to one board as opposed to a ski for each leg, the first thing they need to learn is to stand and balance on the board with one foot, than attach the other foot between the front and back binding and learn to balance on that while staying over center. "You're standing on a platform," Wetmore said. "If you get too far forward, the board goes out behind you, if you go too far behind, it slips out in front of you. So, learning how to balance is the primary thing." Once that's accomplished, riders must learn to shift the balance from the toe edge to the heel edge of the board. This allows the rider to turn. As you come across the hill on a toe edge, point the board into the hill, then lift the toes, look in the direction you wish to turn and come across the mountain by transferring your weight to the heel edge. "You know you're doing it right if, when you're balancing on your toe edge, all of you is over the toe edge. Your knees are over the toes, and you have your belly button poking out," Wetmore explains. "If you're on your heel edge, you would be kind of squatting, sitting in an imaginary chair, with your spine aligned over your heel edge. "If you ride down the hill with the board flat, you'll tip over. Without any edge in the snow you have no way to control it. But after you learn how to turn, the rest of it is just tweaking those turns, burying the turn shape, the turn size and the amount of pressure. It's basically fine tuning." How far a rider wants to go after that depends on the individual's confidence level or ability. Wetmore does not recommend attempting a halfpipe until you can turn proficiently in both directions. As with anything new, it will take patience and confidence. Wetmore has had students come in with the attitude they would never learn, and they didn't. Those who are determined usually have some degree of success. Just ask Fred Stern. "It doesn't matter what age you are, if you're willing to suffer through three days of falling until you find your balance point, and wear appropriate protective gear to teal with bumps and bruises, you can learn it."